To recognize businesses or organizations who maintain the highest standard of excellence throughout the Superior, Douglas County, and Twin Ports communities. 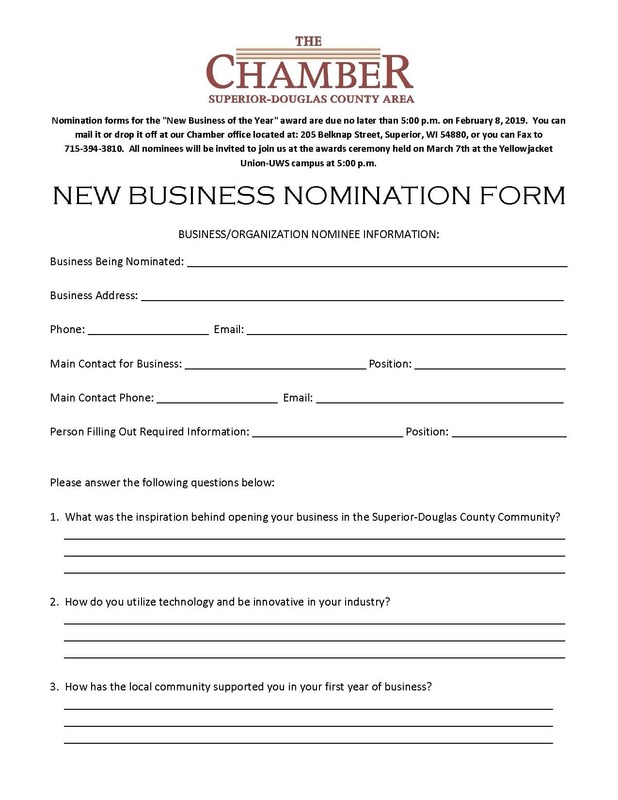 Any community member may nominate a business for recognition (including their own if a Chamber member), and only Chamber member businesses are eligible for recognition. (Click here to see Business Directory of Chamber Members). In general, nominees should be those whose business practices and professional conduct contributes to a sense of cooperation within the entire business community, and which helps promote the Superior – Douglas County area as a good place to live as well as do business. Note: “New Business of the Year Award” may go to a non-chamber member business. Register here to attend the 66th Chamber Annual Meeting & Business Awards Event. The Superior-Douglas County community has seen a significant amount of new economic development! All businesses that opened during the calendar year prior to the awards ceremony event held in March automatically qualify for this award and will be contacted to request submission of their own accomplishments. Judging for this award will be based on potential community impact, use of innovation and technology, and overall community awareness, in addition to their submission. Qualified candidates for this award must either live or work in Douglas County, Wisconsin, and were 40 years old or younger during the entire 2018 awards year.